If real rivalry requires memorable moments, high stakes and controversy, than USA-Costa Rica certainly fits the bill. HARRISON, N.J. — If real rivalry requires memorable moments, high stakes and controversy, then USA-Costa Rica certainly fits the bill. Pick your favorite incident—there are a bunch from which to choose. The initial spark came back in 1989, when the Americans and Los Ticos both ended long droughts and qualified for the World Cup. The road to Italy included matches in San José and then suburban St. Louis, where a Costa Rican trainer who’d been treating a fallen player during the first half reached inside goalkeeper David Vanole’s net and snapped his good-luck flag in half. Vanole saved a late penalty to preserve the 1-0 triumph, and the two teams have been trading blows, beat-downs and the occasional insult ever since. There was the dramatic draw in that followed Charlie Davies’s tragic car crash in Washington, D.C., where Jonathan Bornstein’s late header helped doom Costa Rica’s World Cup campaign. There was the infamous Snowclasico in 2013, where the Americans got their qualifying run back on track. And then there was last November’s 4-0 drubbing in Costa Rica, which cost Jurgen Klinsmann his job. The stakes typically are high, and the USA and Costa Rica have played games that frequently deliver. But if real rivalry requires edge, animosity and something personal that transcends the field, this one is probably lacking. From an American perspective, certainly, USA-Mexico always will be first. Nevertheless, recent games against Los Ticos have been just as vital, competitive and unpredictable. While Friday’s World Cup qualifier between the sides here at Red Bull Arena doesn’t have feature the hype or hysteria that surrounds USA-Mexico, it’s massively important. And it very well could become another chapter in a narrative that’s been increasingly compelling. Since 1989, it’s Costa Rica and the USA who have risen to challenge Mexico as CONCACAF’s dominant power. In aiming for El Tri, they’ve constantly run into each other. Los Ticos hold a slight 15-14-6 all-time edge. In their favor, they’ve created a home-field advantage in Costa Rica that’s proven to be a higher hurdle for the USA than even Mexico City. And they were the best-performing side at the most recent World Cup, where they fell to the Netherlands in the quarterfinals. 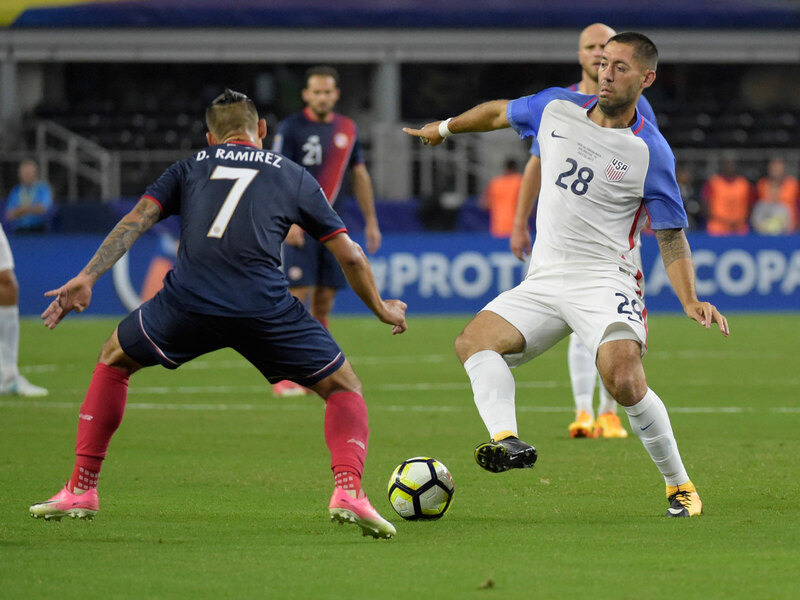 The USA has lost a couple home friendlies against Los Ticos but have held serve in qualifiers, at the Gold Cup and during last summer’s Copa América Centenario, when it demolished Costa Rica, 4-0, in Chicago. The Americans must maintain that home-field advantage Friday. Costa Rica is in decent shape in the Hexagonal at 3-1-2 and it has a four-point lead over fourth-place Panama—the top three finishers advance directly to Russia. The USA (2-2-2) leads Panama by only a point and has zero room for error at Red Bull Arena. Next Tuesday’s mid-afternoon game in Honduras will be a challenge, leaving the points at stake Friday critical to the Americans’ qualifying prospects. Arena’s history with Costa Rica includes the 2000 loss that featured Hernán Medford’s disputed stoppage-time penalty kick and the subsequent argument with referee Peter Prendergast that led to multi-game suspensions for the coach and captain Claudio Reyna. Arena’s team beat Costa Rica in Los Ticos' only Gold Cup final appearance in early 2002 then went on to the World Cup quarters. But he’d suffer a heavy 3-0 defeat in San José three years later. Arena’s current players know that history and respect that talent. There isn’t the personal tension or loathing that accompanies USA-Mexico. That comes from the size and ambition of the two countries, their proximity and the obvious and numerous cultural ties between them. The millions of Mexicans who’ve moved to the USA only add to that rivalry’s texture and importance. Costa Rica doesn’t have nearly the same presence north of the Rio Grande. According to the Migration Policy Institute in Washington, the number of Costa Rican immigrants in the USA is dwarfed by those from elsewhere in northern Latin America. For example, in 2015 there were 1.4 million Salvadorans residing in the USA, 928,000 from Guatemala, 11.6 million from Mexico and just 90,000 from Costa Rica. That impacts a rivalry, and it led the U.S. Soccer Federation to feel pretty confident it’ll have that home-field advantage at RBA. Bradley and his teammates still know they’re in for a battle on Friday, however. Where Wanchope and Medford once caused trouble, now there’s Bryan Ruiz, Marco Ureña and Christian Bolaños. In Celso Borges, Los Ticos boast a center midfielder who can shape a game. And in goal, there’s Real Madrid star Keylor Navas. “The fact that they’re such a quality side certainly builds [the rivalry],” USA defender Graham Zusi said. Zusi referenced the play back in 2013 when Ticos forward Joel Campbell dived and drew a yellow card on Matt Besler that resulted in the center back’s suspension for the ensuing Mexico qualifier. Campbell was reprimanded by FIFA and the Costa Rican federation ultimately was fined 10,000 Swiss francs for a variety of violations during their Snowclasico revenge tour. The American bus was egged, practice sites suddenly fell into short supply and balls weren’t provided for training. At the ensuing game at the Estadio Nacional, USA captain Clint Dempsey’s microphone was turned off as he read a pre-game statement. The players were welcomed by the crowd with whistles and portable lasers. “I don’t think it’s at that level of Mexico by any means. But I think something’s kind of building there,” Zusi said. Friday’s game is another big one between the teams. As usual, the subplots are pretty much confined to the field. But that’s appropriate for a match that will have a significant impact on the USA’s bottom line. The upcoming 90 minutes at RBA will say a lot about whether Arena's team gets playing time in Russia. The USA is in good form, unbeaten in 2017 and shouldn’t be cowed by the circumstances. It will also be accustomed to seeing Costa Rica on the other side in a game that matters.